•Hinges are handed, specify handing. •For use on aluminum doors with aluminum frames. •Hinge is designed to insert in slot in the door or frame. 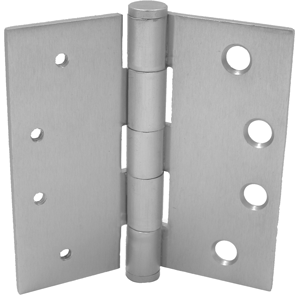 HINGE SWAGING: A standard swaging of our standard weight full mortise hinge when closed to parallel position provides a 3/16” clearance between leaves. 1 screw pack includes 1/2 machine screws (12), and 1/2 wood screws (12).